I received a sample product in order to facilitate this review. All opinions are 100% my own. I was lucky enough to come across another great stocking stuffer recently! I have two boys who are addicted to their electronics. Whether it's games on the 3DS or educational apps on the iPad, or even annoying YouTube videos on their iPod, they are always messing with some sort of electronic device. The problem is, I get SO tired of hearing all of that stuff.. In our house, earbuds are a MUST.HAVE. so mom doesn't go crazy! 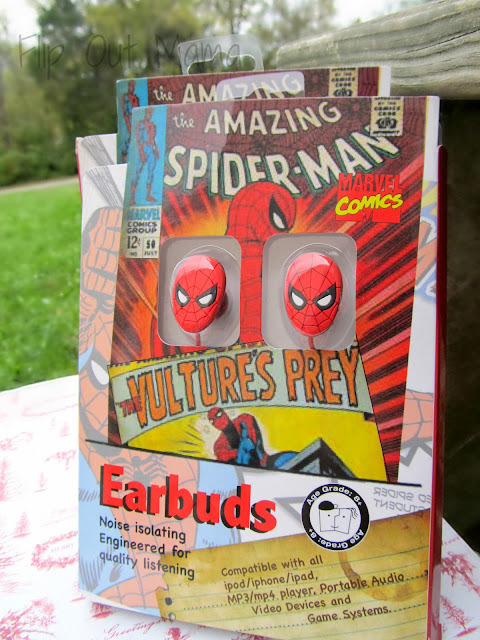 I absolutely love these Spiderman earbuds! They are compatible with just about any device you could think of, including iPods, iPhones, iPads, cd players, computers, personal DVD players and gaming systems. Plus, they are SO cute! My boys love these! They are comfy on their ears too, which is really hard to find in an earbud. They are often made for bigger ears, and then my guys complain that their ears are hurting. But, not with these fortunately! Anyhow, we love these earbuds, and would definitely recommend them if you are looking for a great earbud for your kiddos! You can pick up your own pair right HERE! What a great deal! Only $8.99 and FREE shipping with Amazon Prime! With a price this great, I would get a couple of these if I were you! I received a sample product in order to facilitate this review. All opinions are my own.